When the University District Gateway Bridge finally opened last year, connecting the eastern part of downtown Spokane to the East Sprague neighborhood, it was only the latest accomplishment for the public development authority charged with transforming the 770-acre district. The University District — the economic and educational hub roughly between Browne and Hamilton streets, Sharp Avenue and Interstate 90 — includes Washington State University-Spokane, Gonzaga University and the eastern third of downtown Spokane. And lately, it's been booming. Today, Washington State University's Spokane-based medical school is not only churning out new doctors, the University of Washington's partnership with Gonzaga has made Spokane a top destination for UW medical students as well. And within the next two years, the Central City Line will bisect the district with high-frequency bus access from the district to downtown, Browne's Addition and Spokane Community College. And yet, as City Councilwoman Candace Mumm raised during a council meeting this month, there's a big hole missing from all the recent development: housing. "I'm very concerned — and I've said this many times — that we're creating a commuter campus with the University District because the [educational] institutions are not wanting to be in the housing business," Mumm says. It's a concern that Lars Gilberts, executive director of the University District Public Development Authority, generally shares. As successful as the district has been, he says, there are still a lot of gaps. "It's like Swiss cheese," says Gilberts. "It's not one hole. It's lots of holes." As the University District is preparing to launch the next update of their master plan in March, outlining how to generate more educational and business growth, Gilberts expects the housing gap to be featured prominently. "Right now, we're pretty close to 1,000 units short in the University District. With how things are developing, those could be absorbed pretty darn quickly," Gilberts says. "We're going to have more students, more programs, more professors. ... I can see the current need being doubled or tripled." After all, the housing crisis is citywide. For around three years, the city's apartment vacancy rate has hovered at about 1 percent. In particular, Gilberts says, there's a lack of diverse housing options south of the University District bridge. Yes, Catholic Charities has built hundreds of units in the area targeted at housing the formerly homeless. Spokane Housing Ventures manages a number of low-income housing complexes in the district. But there's not a lot of nonsubsidized housing in that area, Gilberts says. "I want to place the person who is on disability who needs to be close to medical services [right next to] their doctor," Gilberts says. "The market can support both." Ideally, he says, there would be a broader mix of apartments. There would be more condos. And there would be more of the holy grail of walkable urban design: Mixed-use buildings, combining retail on the ground floors with housing on the top. "If I could walk out of my apartment, go downstairs, get a cup of coffee, go to class and then you go have dinner at restaurant row?" says Ryan Layton, managing broker at American Real Estate. "Those type of areas flourish in bigger [cities]." But so far, despite all the demand for more housing in the district, development has been slow to respond. "With vacancies so low, why aren't we seeing some of those things happening here?" Gilberts asks. Eight years ago, it looked like the universities themselves might be intending to build a lot more housing in the University District. In 2011, a company called Campus Advantage announced plans to purchase the six-story Jensen-Byrd Building at Washington State University-Spokane, tear it down, and build enough housing for 425 students. But that sparked a flurry of opposition from local historical preservation advocates, and the proposal was nixed. Eight years later, the Jensen-Byrd is still empty, its future still unclear. Layton calls the Jensen-Byrd an "albatross," noting that its low ceilings and other obsolete design features make rehabbing hard to pencil out for developers. "I heard someone say: The best thing that building could have is a match, some gasoline and someone to walk away and it mysteriously gets burned down," Layton says. "That's not going to happen." Ultimately, the logistics of the Jensen-Byrd may be irrelevant. As WSU-Spokane has pursued the development of the medical school, the notion of pushing for student housing has faded away. "The question came up again when I was chancellor," former WSU-Spokane Chancellor Lisa Brown says. "Given that we have a graduate and professional students, students with families, dormitory housing just didn't seem like the right option." That sentiment has continued. Jim Mohr, WSU-Spokane vice chancellor for student affairs, says that a 2017 survey found that only about 25 percent of students indicated an interest in WSU adding student housing. "The schools announced they are not going to be providing housing," Mumm says. "Well, then, who is?'" Anyone interested in building housing in the University District faces a number of challenges. "Trying to assemble enough land is difficult," says developer Chris Batten of RenCorp Realty. "Generally speaking, most of the parcels that you could buy are relatively small." If you want to build a big apartment complex, you've got to corral all those little properties, a project that can take years and cost millions. And unlike the downtown core, much of the University District is still saddled with parking minimums. Want to build higher? Then you need to build more parking spaces, which can often take more land. Either way, Layton says, mixed-use downtown development means taking a big risk in a city that's often wary of rolling the dice. "This isn't a home-run-hitting town. It's a lot of singles and doubles," he says. "And so you've got to be careful how hard you swing." Three years ago, Downtown Spokane Partnership Director Mark Richard says he and Californian developer David Schneider started specifically looking for buildings in the University District that could be transformed into apartments. "We were going door-to-door and asking property owners that didn't have for-sale signs on their buildings if they were interested in selling," Richard says. And Schneider, owner of University Housing Partners, seemed like the right guy for the job. He was responsible for 940 North, the 61-unit, six-story, high-end Gonzaga student apartment complex that opened in 2016. That year, he'd also proposed a $20 million mixed-use project at the site of the old Midas Muffler building on Division and Spokane Falls Boulevard. "That is a gateway location," Gilberts says. "That is a prime spot." The plan was to call it the University District Apartments, 154 apartment units on top of 12,000 square feet of retail space. But Schneider pulled out of the deal. The ground itself was polluted. He says it would have cost $2 million to clean up. In the University District, you've got more than a century of pollution, starting with the burnt wood and slag left behind by Spokane's Great Fire 130 years ago. On top of that, Spokane built and tore down railroads and factories, old gas stations and dry cleaners, that all left behind a slop of contaminated soil. 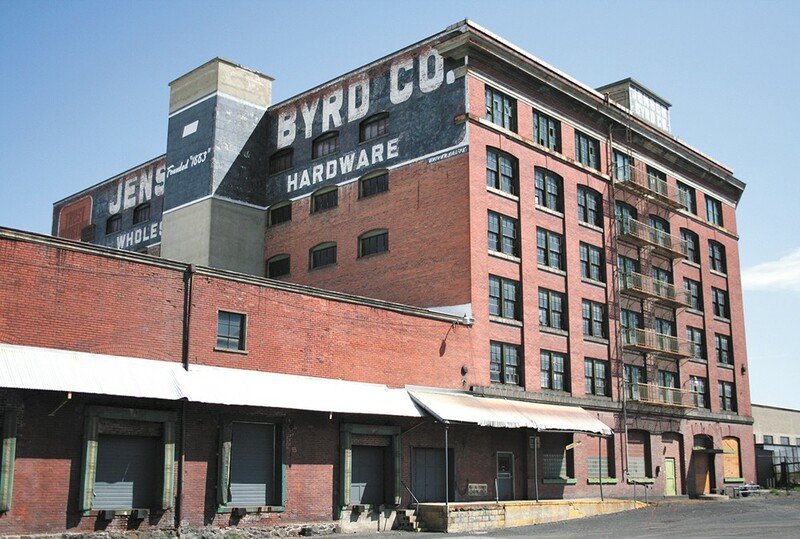 Eight years ago, WSU-Spokane was looking at replacing the Jensen-Byrd building with apartments. Today, the building is still vacant. Schneider says he tried to get the city of Spokane to pay the full cost of environmental remediation, but the city declined. "Who's the biggest loser there? The city," Schneider says. "If I would have built the building with apartments, where are the tenants going to go? They're going to go around the corner to eat. They're going to do their dry cleaning there. It would dramatically increase the revenue in the area." Teri Stripes, a Spokane city planner, says that there were routes that Schneider could have gone down to ease the cost. But she also says that "brownfields" — potentially contaminated ground — remains one of the biggest challenges for the University District. "As an individual property owner, you don't know what you don't know," Stripes says. Both the city of Spokane and the University District have put a major focus on addressing the pollution predicament. They're both part of a coalition applying for an Environmental Protection Agency grant to provide environmental assessment and remediation planning funds to repair brownfields. In the meantime, there's still hope for the Midas Muffler lot. Last March, the lot was sold to wealthy local developer Lanzce Douglass. Douglass did not return an Inlander request for comment, but the name of the LLC he used to purchase it, "Riverpoint Campus Apartments," suggests that the dream of more housing at the lot isn't dead. Douglass hasn't yet fixed the contamination issue. But according to the Department of Ecology, Douglass is working with them to try to finalize a voluntary cleanup plan. Gilberts says the University District might be able to help ease issues with such sites. "If the community saw that as a catalytic site, there's a lot of ways to impact that," Gilberts says. This month the Spokane City Council voted to hand another opportunity to the University District: They transferred an estimated $1 million property — the former Visit Spokane building on Main, on the eastern edge of downtown — to the University District PDA. "This is an opportunity on this corner ... to look at really providing the housing that is needed to support our future doctors and our people who are professors there," Councilwoman Mumm said from the dais. Gilberts says that's a possibility. But he also says the role of the University District PDA isn't necessarily to be the developer that fills in what the district lacks. The key with the new property, he says, is to try to figure out a project that isn't just another nice building, but one that's a catalyst to spark a whole wave of University District development.